We love Paul McCartney. We love Dave Grohl. But if ‘Cut Me Some Slack’ is the best rock ‘n’ roll had to offer last year, the genre’s in some real trouble. A teenager from New Zealand and two French “robots” shall lead them. What makes music special is its seeming randomness, of magic moments coming from where you’d least expect them. 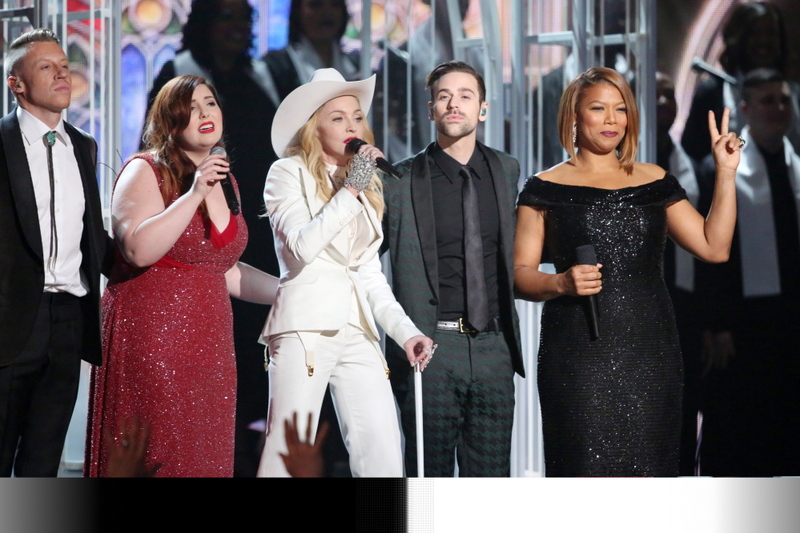 Sunday night’s Grammy Awards proved that. In a room filled with music history and industry powerhouses, Lorde and Daft Punk took major awards. And there were other moments, too — some moving, some boring, some baffling, some just plain fun. MUSIC TO OUR EARS: An emotional performance of “Same Love” by Macklemore & Ryan Lewis with Mary Lambert, featuring dozens of couples exchanging vows. Guest Madonna seemed a bit wobbly, but her “Open Your Heart” fit nicely with the sentiment. SOUR NOTE: What’s the point of assembling an odd rock super group with Nine Inch Nails, Queens of the Stone Age and Lindsey Buckingham for the finale and cutting them off mid-song? MUSIC TO OUR EARS: That stellar funk jam with Daft Punk, Williams, Nile Rodgers and Stevie Wonder, mixing in pieces of Chic’s “Le Freak” and Wonder’s “Another Star.” It achieved what many of these collaborations often can’t, illustrating the music that inspired a modern hit and paying tribute to the artists who blazed the trail. SOUR NOTE: Then again, there’s Metallica and Lang Lang. Metallica can make enough noise on its own, thank you. MUSIC TO OUR EARS: Pharrell Williams and Giorgio Moroder acting as onstage interpreters for Daft Punk as they piled up trophies. Williams had fun with the inherent ridiculousness of sharing the stage with two tuxedoed guys in metallic masks. “Of course, they want to thank their families,” Williams said. Daft Punk wasn’t alone in weird headgear: Williams looked like he was auditioning to be a park ranger. MUSIC TO OUR EARS: Robin laid it on a little too Thicke in his duet with Chicago, taking over and showboating through some of that band’s hits. When they broke into Thicke’s “Blurred Lines,” however, that famous horn section gave the song an extra punch, adding a little nod to James Brown in the process. SOUR NOTE: Carole King and Sara Bareilles was an inspired choice for a duet, but they never quite clicked. Pink and Nate Ruess made for a much better twosome on “Just Give Me a Reason,” but Pink opening her segment with acrobatics was a waste since we’ve seen it before. SOUR NOTE: We love Paul McCartney. We love Dave Grohl. But if “Cut Me Some Slack” is the best rock ‘n’ roll had to offer last year, the genre’s in some real trouble. SOUR NOTE: Not to blame Taylor Swift, but it seemed we saw more camera shots of her dancing in the front row to Kendrick Lamar and Imagine Dragons than we saw of Imagine Dragons. Odd irony considering that being upstaged herself at an awards show was such a key moment in her career. MUSIC TO OUR EARS: Let’s give credit to the camera operators, though, for that shot of Yoko Ono and Sean Lennon dancing to Paul McCartney singing “Queenie Eye,” with Ringo Starr on drums. Forty-five years of history, and tons of water under the bridge, went into that image. The 80-year-old Ono grooved to “Get Lucky,” too. SOUR NOTE: Where was Timberlake, anyway? He was omnipresent in the commercials, but not on the show. SOUR NOTE: LL Cool J has proven himself as a rapper and actor. As a major awards show host, not so much. Perhaps it was his fate to follow so quickly after Tina Fey and Amy Poehler on the Golden Globes, but it was a journeyman’s job. His opening monologue about music’s universality showed he wasn’t going to poke even mild fun at his fellow musicians. He was irrelevant thereafter. SOUR NOTE: Can’t understand why the Grammys gave such a spotlight to Hunter Hayes and a bombastic song that nobody knows. His voice wasn’t up to it, and the onscreen quotes by Steve Jobs, Lady Gaga, Johnny Depp and the like were bewildering. Major reason why the show was slow to gain momentum; Legend, Swift and the usually dependable Katy Perry didn’t help, either. MUSIC TO OUR EARS: That moment when Merle Haggard delivered the opening line to “Okie From Muskogee” — “we don’t smoke marijuana in Muskogee” — with a knowing glance at Willie Nelson on the side of the stage.